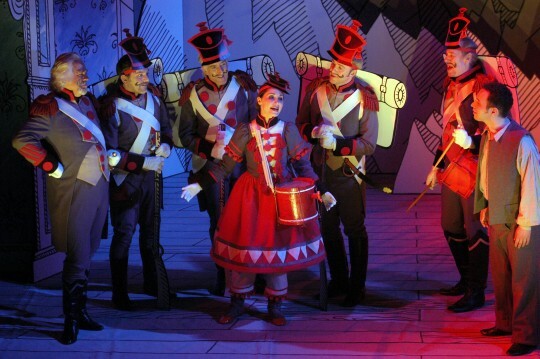 Of all the operas by Donizetti, The Daughter of the Regiment (La Fille du Régiment) is possibly the finest, with its combination of great comedy and musical verve. 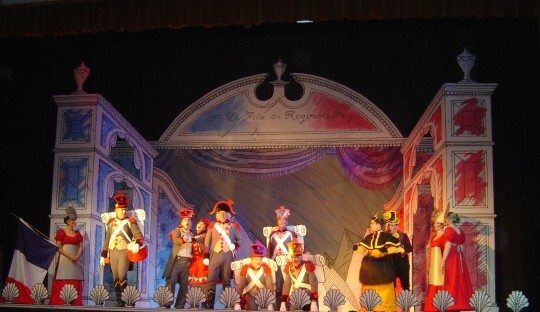 It tells the story of a foundling, Marie, who is adopted by a regiment; she entertains the soldiers as their vivandière / servant and enjoys their company. She falls in love with Tonio, a country boy who saves Marie from falling over a precipice, who enlists as a soldier for her sake, but there are complex plans afoot for marrying her to a Duke..
With a black and white set, and outrageously colourful and inventive 19th century costume, The Daughter of the Regiment toured to 30 venues across the UK. 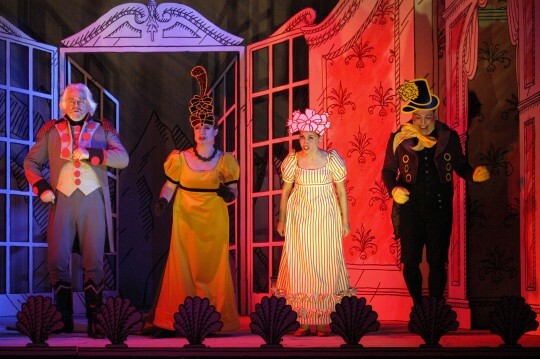 The opera was conducted by Philip Sunderland with a design by Gary McCann and Gabriella Ingram. 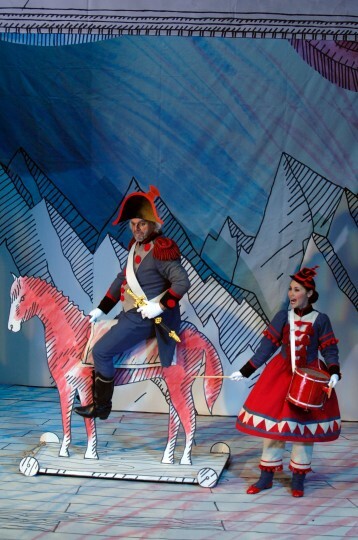 I faced Swansea City Opera’s performance of Donizetti’s The Daughter of the Regiment on an empty stomach (well, bar a bag of crisps and half a square of millionaire’s shortbread). Only someone with full liver failure could have viewed it with a more jaundiced eye, and I was captivated within minutes! 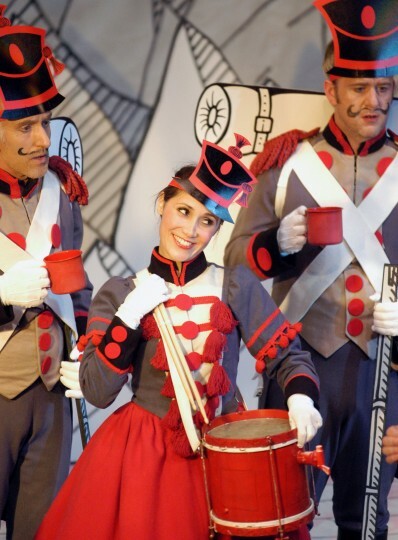 The opera tells the story of Marie, a vivandiere, a nineteenth century soldiers’ groupie who acted as a cross between Florence Nightingale and a St Bernard (nice bit of business when she serves the solders rum from her drum). This one turns out to be the daughter of a countess but still gets to marry her captain. Michaela Bloom played Marie. On her entry, Sulpice – a fine bit of comic acting and singing from Brendan Wheatley – remarks; “Isn’t she lovely?” and we could only agree. She has the looks, the voice, and she can act. What’s to stop her going far? 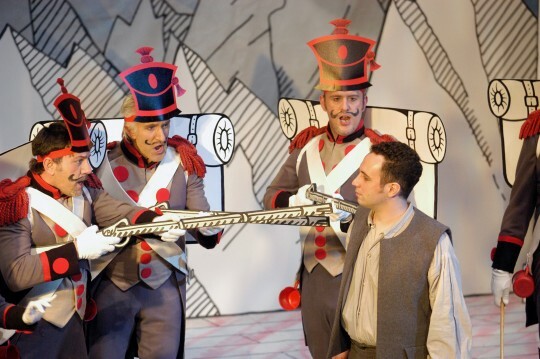 Swansea City Opera’s touring arm often performs in smaller venues, and places which don’t normally get opera, so the orchestra is reduced to a sextet, ably urged on by Philip Sunderland. 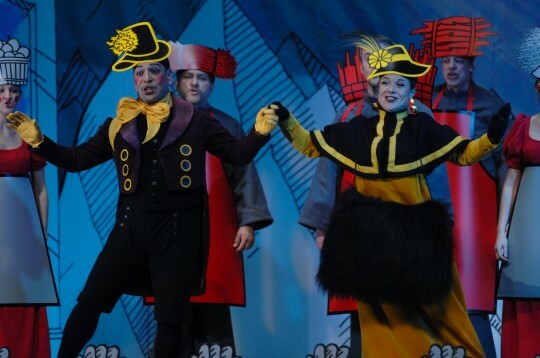 Making a virtue of necessity, the set and costumes are brilliantly cut down to cartoons (take a bow, Gary McCann and Gabriella Ingham). I’m sure it’s all not exactly as Donizetti wrote it, but I’m equally sure the spirit and tone are exactly as he would have wished! 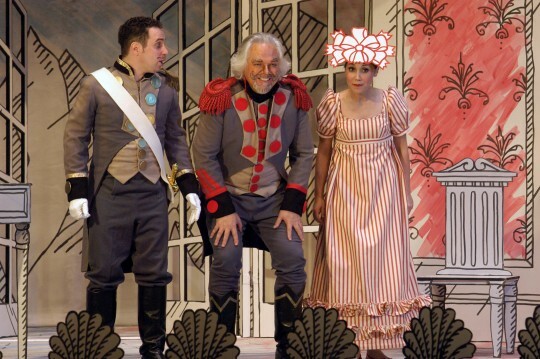 I faced Swansea City Opera’s performance of Donizetti’s The Daughter of the Regiment on an empty stomach (well, bar a bag of crisps and half a square of millionaire’s shortbread). Only someone with full liver failure could have viewed it with a more jaundiced eye - and I was captivated within minutes! The company were masterful in all departments of their craft, and musical director Philip Sunderland's reduction of the score to a sextet was exactly right. The singing was perfect but the night, of course, belonged to Michaela Bloom as The Daughter of the Regiment herself - achingly beautiful and flirtatious, with the most powerful, accurate and fluid coloratura soprano voice you could wish for.